In a politically polarized nation, art that is intended to make people think and foster dialogue ought to be seen as a social good, not as a threat to democracy. As two provocative exhibitions on university campuses have shown, careful planning is required to appropriately contextualize some works; and even with forethought, controversy may still erupt. 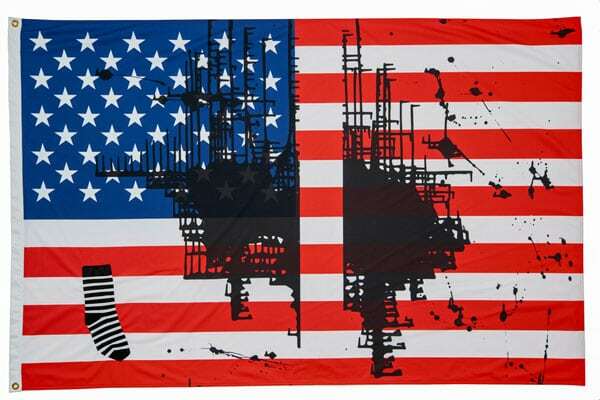 Each flag points to an issue the artist is passionate about, a cause they believe is worth fighting for, and speaks to how we might move forward collectively. Conceived in response to the current political climate, Pledges of Allegiance aims to inspire a sense of community among cultural institutions and begin articulating the urgent response our political moment demands. Among those objecting to Meckseper’s flag were Kansas’s Republican governor, Jeffrey Colyer; secretary of state Kris Kobach; two Kansas Republican candidates for Congress; the University of Kansas College Republicans; Fox News; and right-wing media sites like the Daily Caller and Media Research Center. Among those rallying around Meckseper’s flag were the American Civil Liberties Union of Kansas, the National Coalition Against Censorship, and the Foundation for Individual Rights in Education. A phone call from the governor to the university’s chancellor resulted in the flag being removed from the flagpole—which remains empty—with the chancellor citing unspecified public safety concerns. The flag was relocated into a gallery in the Spencer Museum, where it will remain until July 31st (the originally scheduled final date for its display), despite efforts by some to have it completely removed from the campus. Saralyn Reece Hardy, the Spencer’s director, explained that long before the first flag was raised, the Spencer and the Commons had worked to ensure the project would foster dialogue—which some might argue is an essential element of university life. Since being moved to the gallery, Meckseper’s flag has been further contextualized for visitors with “an educational binder, an always-present staff member to answer questions, and a comment book where visitors can note their thoughts. Lately, visitors have used the comment book ‘very vigorously,’” according to Hardy. Meanwhile, at the Blanton Museum of Art at the University of Texas at Austin, a new exhibition with the potential to both foster dialogue and to upset some viewers has been planned with great care. The City is “a four-panel painting of a modern-day Ku Klux Klan meeting, by the Mexican-American artist Vincent Valdez.” Acquired by the Blanton in 2017 as part of a collection the museum is building around social issues, the “charged imagery” of Valdez’s work resulted in a deep sense of “curatorial responsibility” and more than a year of planning before the work was presented. Ray Williams, director of education and academic affairs at the Blanton, explains, “When you’re looking at a life-sized group of the Ku Klux Klan, you sort of have to know that that imagery is full of historical and current violence, and people who are looking at it have very different experiences of that.” Valdez intended the painting to “impede social amnesia” about the Klan’s presence, and his use of a cell phone and a modern pick-up truck makes it clear this is not a scene from the distant past. The Blanton engaged local community members and faculty members from many disciplines in planning the exhibition. The curatorial staff worked hard to contextualize Valdez’s work, to invite feedback from visitors, and even to place the work behind a buffer wall, with an “advisory message” that allows people to decide if they wish to enter the gallery. The initial reception to this exhibition, which opened in mid-July, has been largely positive so far. Both Meckseper’s flag and The City had the potential to upset people, but the Blanton and the Spencer leaned into that friction and, using contextual padding, tried to turn it into an educational moment, something that university museums are in a unique position to do. “We thought, and we still think, that the national conversation among colleges and universities in our country is supremely important right now,” Hardy, the Spencer’s director said, adding that a museum on a large research campus has a special role in that conversation.